BluePen Journals is a non-governmental organization that was established in October 2012 to publish double-sided blind reviewed and refereed articles. It was spurred by the internal drive to expand the frontiers of academic research excellence and knowledge accessibility. This organization is dedicated to the advancement of research in all fields of study with respect to the subjects of our functional Journals and the exchange of knowledge, information and ideas. Shortly after preliminary preparation of the organization�s foundation, frantic efforts were made by the founders to ensure that some of the best brains available in the international community, teamed up to enhance a proper peer-review and turn-around processing time for manuscript(s); in other to encourage a global academic research-driven community. As the world is gradually becoming a global village, it is imperative that accessibility of quality and innovative research article, be made as easy as possible by all and sundry; to encourage a fair distribution of knowledge in new areas of scientific breakthrough so as to move the world from its present state to a more developed state. In our little but crucial way, we hope to reach the outermost part of the world with the most current research publication and bring a turn-around in the history of publication. 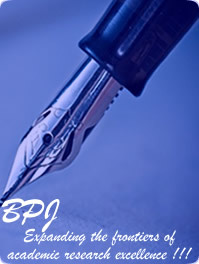 This we hope to achieve with our team of experts from all fields of study all over the world (with respect to the subjects of our functional Journals), who are ready to peer-review, critically evaluate, edit, proof-read, process and publish all research articles that meets the standard of publication of BluePen Journals. To become the leading international, technology - driven, online publishing organization, providing distinctively unique range of manuscripts publication services. To publish the most exciting and innovative research articles from all fields (with respect to the subject of our functional journals), all over the world within the shortest possible processing time. And make it available to Researchers, Research scholars, Academicians, Industrialists, Consultants, Prospective scientists and Readers. Professionalism, Authors� and readers� satisfaction, Corporate commitment, Value creation, Strict adherence to internationally accepted publication ethics.